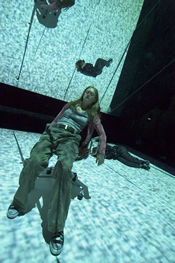 A tilted mirror reflects the interior world of Sarah Kane's last play, 4:48 Psychosis. Originally produced at the Royal Court Theatre in London in 2000, this play has been staged internationally but has never before received a major U.S. production. 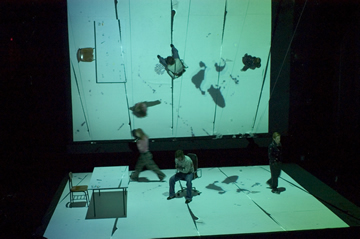 Now, in a restaging of the Royal Court's original production directed by James Macdonald, 4:48 Psychosis is touring major arts venues across the United States, and many Americans are encountering one of Britain's most daring, influential dramatists of the 1990s for the first time. Compared during her lifetime to Beckett and Bond, Kane's work--which includes the corrosive Blasted, the extraordinarily painful Cleansed, the violently carnal Phaedra in Love and the four-character dramatic poem Crave--is demanding and extreme. She was classified as an "in-yer-face" British nihilist playwright in the 1990s (along with Mark Ravenhill, Judy Upton and Joe Penhall), but a re-reading of her plays reveals that she was clearly a writer of classical ambition both in form and content, and not simply an of-the-moment "shock" artist. In Kane's writing there is a fusion of punk spirit and classical reach, and with each play, the link to the ancient dramatists becomes more transparent. Kane, unlike most of her close contemporaries in Britain, wrote plays that spoke directly to contemporary reality while steering relatively clear of realistic trappings. She sought to reclaim the neo-modernist word-geography of T.S. Eliot at his peak as much as Shakespeare's "blasted heath." Her work--which is the main subject of the critical study Love me or Kill Me: Sarah Kane and the Theatre of Extremes by Graham Saunders, and a major subject in Aleks Sierz's book In-Yer-Face Theatre: British Drama Today--seeks to uproot drama from its predominant Victorian and post-Victorian mode of representational comfort and psychological acuity, returning it to the presentational, irrational, blood sport-infused drama of the late Greeks and Romans. The audience in Kane's plays endures, suffers, and is shocked, horrified and disturbed by the writer's visions. They are asked to be forcible witnesses to acts of astonishing violence and rage in almost Grand Guignol extremity. While 4:48 Psychosis could be seen as a comparatively serene play in Kane's oeuvre, in that the physical violence is only described and not seen and the play's motion is almost exclusively internal, it does demand of an audience an uncompromising relationship to its subject. Mental illness is not held up for view as a case study here; the audience is rather asked to enter the state of illness: to experience with artful distance the pain of thoughts fractured, seemingly divorced from the self. This is a testament to Kane's talent and skill as a writer and poet. Broken-ness is her theme and, as in her other works, it serves as both a means to explore the human condition and an end. This production of 4:48 Psychosis may be seen by some as definitive, since it was directed by Kane's close collaborator James Macdonald, a brilliant director whose work will be seen again in New York this season when Caryl Churchill's A Number opens at New York Theatre Workshop. But it is only one version of the play. It is important to note this because the text is extremely open and can offer significantly variant stagings. On the page, no characters are named or specified in number, age, or gender, and no physical actions or stage descriptions are delineated. The play reads as poem, and is not even expressly or conventionally dramatic. It is, however, a piece for voice and space and for a voice or voices in space across a span of time. Macdonald's extraordinarily sensitive staging does not try to diminish the possibilities of multiple readings. Clear choices are made, though, about the use of video and lighting and spatial composition. Figures are often seen in half-shadow, and are exposed in white light at contrasting emotional moments. A long sequence in the middle is staged in a bluish hospital haze of incessant, eerie somnambulance. Another sequence is played out against loops of video static that reflect the figures' repetitive loops of thought and feeling. The three actors perform with humility, precision, and emotional dexterity. One sequence of particular note places the "patient" voice of actor Marin Ireland, one of the America's best and brightest young stage actors, in a prolonged interview scenario with the "doctor" voice of Jason Hughes wherein she forces herself to stifle vocally and physically the very act of crying. The sequence, lit as if in movie close-up, demands that the actor both express and illustrate clinically the movement of crying in the body, while at the same time inhabiting the emotions associated with anguish. It's a wrenching sequence intensified by the utter simplicity of the staging and the lack of sentimentality with which both the action and text are delivered. Kane's suicide in 1999 has marked the reading of her works significantly over the last few years. A cult of death is forming around her work, as it has around other writers like Sylvia Plath and Anne Sexton. There is an uneasy reverence with which Kane's work is received now, and I think it mars the engagement necessary for an audience to fully experience it. Kane invites death into her plays, and wrestles with it time and again. Hers is a voice of rage in the darkest of nights. Yet it would be more than a shame for her work to be viewed only through the lens of suicide, mental illness, and artistic martyrdom. It is almost as if we are imposing a somewhat hazy Werther-like Romantic filter upon Kane, when her work at its best is frankly carnal, immediate, and un-romantic. She wrote love stories, as most of the greatest writers do, but hers are hard stories of love. When there is martyrdom at play in her work, Kane is careful to take a critical stance toward it. The formal experimentation, emotional risk, and poetic density of her writing transcend reductive biographical readings. Her work was and is alive, fierce, passionate, and caustic. There is a self-reflexive, cruel humor evident in her writing, and most crucially in this, her last, unfinished play. (I say "unfinished" because she was not able to play an active role in the rehearsal or production process of the work's premiere.) She attacks and embraces her figures at one and the same time. She also was clearly, if one charts the dramatic progression from Blasted to 4:48 Psychosis, still very much a young writer finding new ways to make her theatre. Kane's writing is therefore in process, and always will be. While she chose to end her life, the work only stopped, and remains to be read in a state of suspension and speculation as to what might have been. The restless beauty of her work is in its very limitation, and its ardent reach.